^ "Russell T Davies on Who season two". SFX. 2005-10-25. Retrieved 2006-03-18. ^ Sherwin, Adam (2006-04-24). 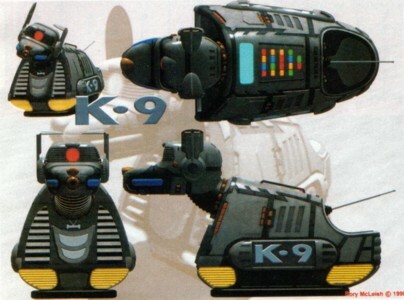 "K9 is back and ready to fight in shining armour". The Times. London. Retrieved 2006-04-25. ^ Lyon, Shaun (2006-07-18). "More on K9 Series". Outpost Gallifrey News Page. Retrieved 2006-07-18. ^ Johnson, Richard (2007-03-11). "Master of the universe". The Sunday Telegraph. p. 3. Archived from the original on 13 March 2007. Retrieved 2007-03-12. ^ Perlman, David (2005-10-04). "NASA's new robots show their stuff". San Francisco Chronicle. Retrieved 2006-04-23. ^ NASA Ames Research Center (2000-06-25). "Introduction, Advanced Technology Field Testing". Archived from the original on 9 February 2008. Retrieved 2006-04-23.